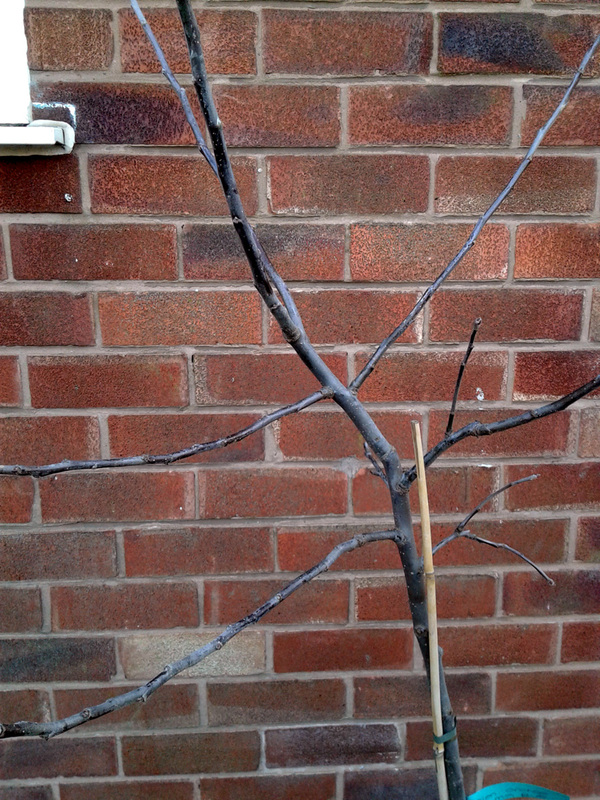 Three apple trees pruned, potted, temporarily staked and awaiting moving to their final growing space. 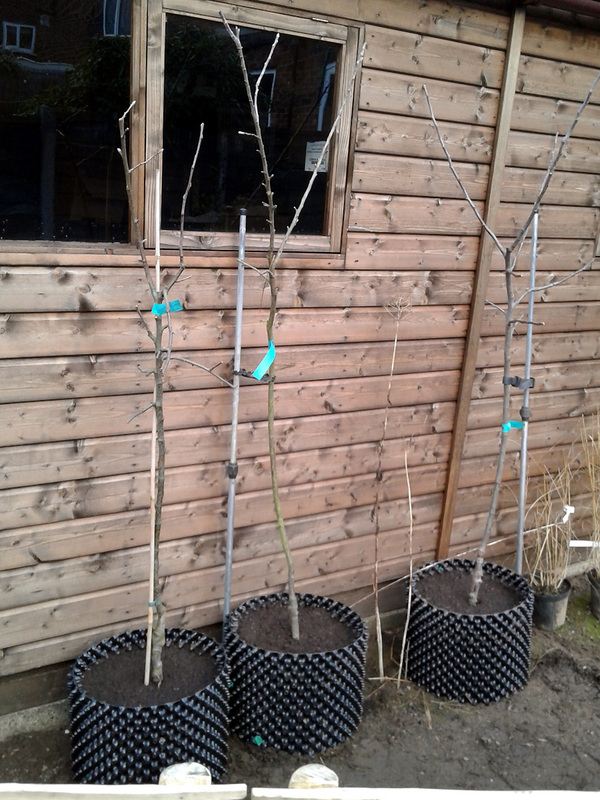 With the weather turning a little warmer and the immediate threat of frost receding this week, I took the opportunity to pot up our newly-delivered fruit trees. Even more importantly, I gave them a formative pruning to set them up for their future roles as small, hopefully highly productive, fruit-bearing trees. As I understand it: formative pruning takes place in the first 1-4 years of the tree’s life. The aim is to establish the framework shape and form that you’d like the tree to develop into, and encourage new growth in keeping with that concept. 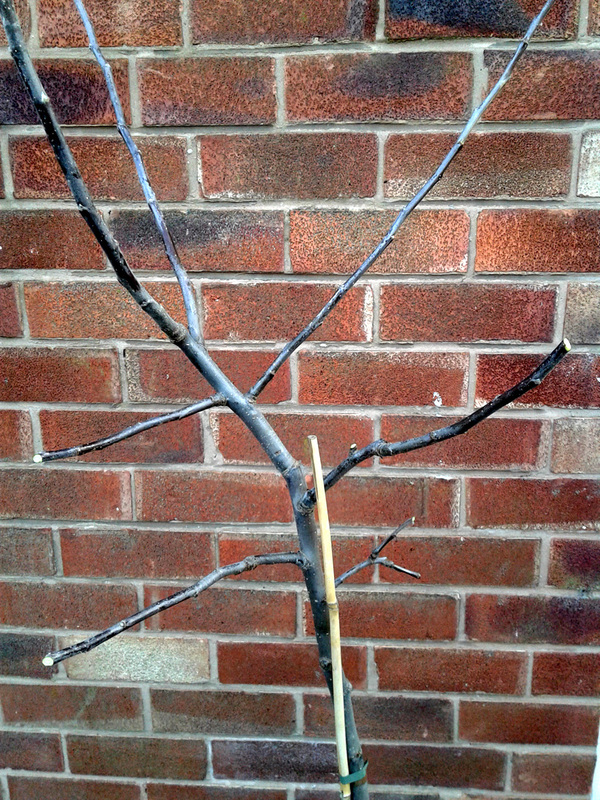 Pruning in winter, when the tree is dormant, generally removes the main, apical buds of individual branches and stems, encouraging new, branching growth from the buds further down towards the trunk. The result should be a bushier, denser canopy and more fruiting spurs. Once the tree’s shape is well established, winter maintenance pruning removes any dead, diseased or damaged growth, thins out any congested sections and helps to keep the tree’s structure well-balanced, light and airy. Maintenance pruning can also be carried out in summer, mainly to control and manage any of that vigorous new growth that might be getting out of hand and ensure a trained tree conforms to type. I started out by taking a close look at each apple tree in turn; assessing the existing structure, checking for damage or poor growth and deciding on where and how far to cut them back. We’ve invested in 2-3 year old small bush trees, rather than maiden whips (single stem) or feathered maidens (single stem with a few small side-branches) to give us a head start on fruiting. As a result they each have between three and six established lateral branches, with one or two leaders. Apart from one or two evident pruning cuts, most of the growth had been left to its own devices, so a lot of the branches were long and quite whippy. After much research and consideration, I’ve decided to develop our trees as vertical cordons, keeping them permanently potted up in Air-Pot containers. They’re all on dwarfing or semi-dwarfing root-stock, so shouldn’t grow too vigorously, but in order to keep a good balance between a relatively small root-zone and the amount of top-growth, I don’t really want them to grow much taller than two metres (six feet, six) or so. Last summer I found a copy of the 1955 Garden Book Club edition of Fruit From Trained Trees by Stanley B. Whitehead, in a National Trust bookshop, for the princely sum of £1. On pages 23-46, Mr Whitehead discusses the establishment of a modern fruit garden that includes trained apple trees in such new-fangled (within the previous 30 years or so) shapes as “cordons”, “espaliers” and “pyramids”. Clearly Mr Whitehead’s words weren’t falling on deaf ears. Stanley B. Whitehead shows us how it was done back in 1955. According to the current RHS advice on cordons, oblique cordons are more productive, but that’s not really practical with the Air-Pot containers and the space we have available, so I’m sticking to vertical. 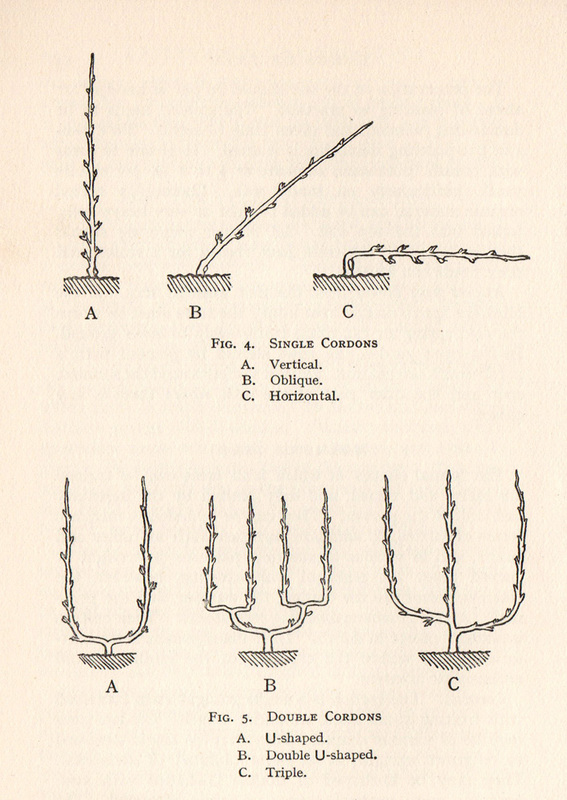 Mr Whitehead’s book also makes mention of the Modified Lorette system of formative pruning and a quick Google search suggests it’s a system that’s still very much in use today. In a nutshell (if I understand it properly) it’s a summer maintenance prune that takes all lateral shoots from the main stem or leaders back to three leaves, not including the basal cluster) and any side-stems on the laterals back to a single leaf. 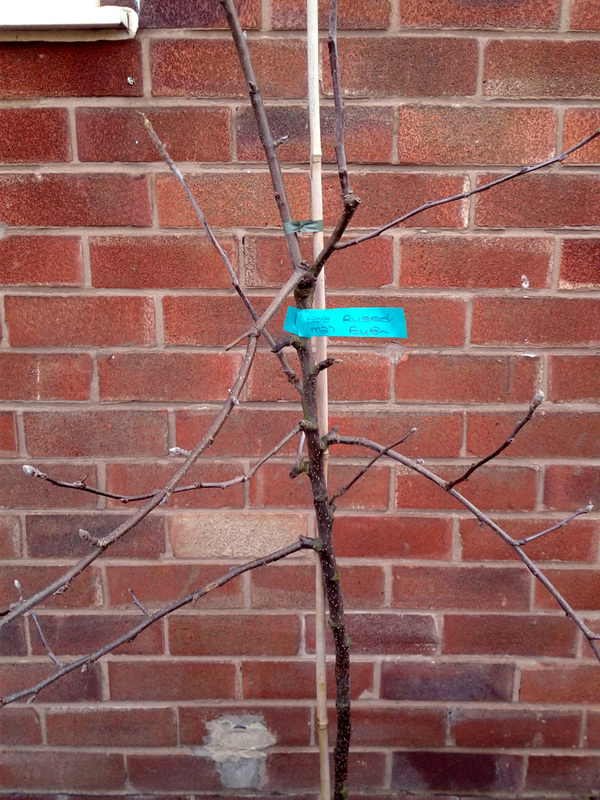 This should help to develop the fruiting buds that will provide next year’s blossom and fruit on fruiting spurs. So that’s what I’ll be doing in August. This tree wasn’t too tall, but had three well-developed laterals with a distinctly downward-slant to them. I shortened those, and took about a third to a half off the twin leaders as well, cutting back to a strong, outward-facing bud in each case. 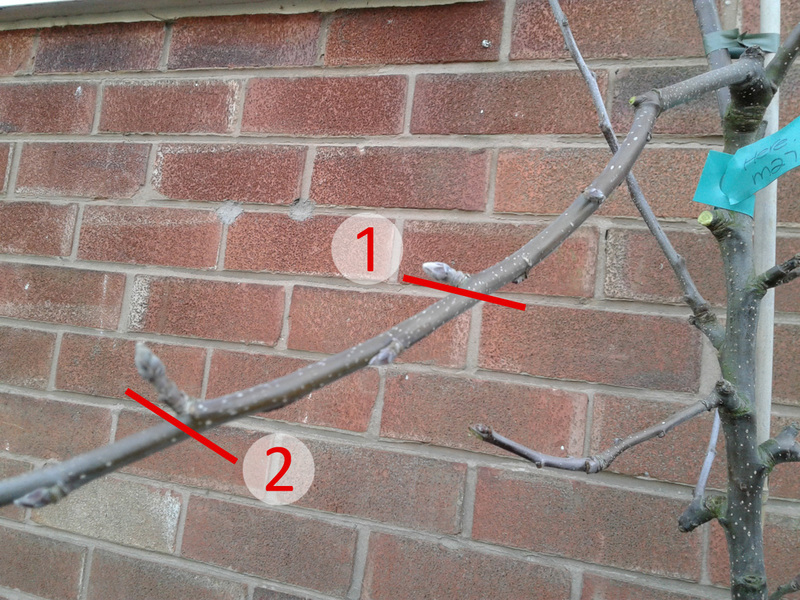 The second photo shows an example of a pruning decision: to cut at point 1 or point 2. I went for 2, on the grounds that those large, fat buds will hopefully bear blossom and even if we remove the fruit this year to help promote root establishment, it will be lovely to see the flowers in spring. And I can always shorted than lateral in summer if needs be. Horizontal branches are good for fruiting, but these are excessively downward-oriented. 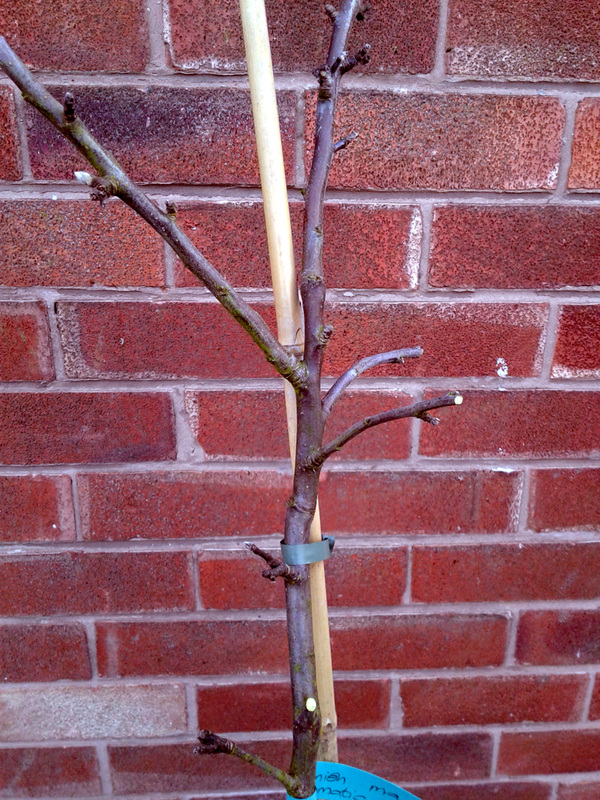 A choice of two potential fruiting buds, by the looks of things… which one to cut to? I went for cut #2 and shortened those straggly branches, as well as the main leaders. This tree was a little awkward, with a double-leader (top-left corner of the pic) coming off from the main stem at quite an acute angle, and several whippy laterals lower down. I’ve shortened the double leaders by around half, and the lowest laterals to four or five buds, depending on which was outward-facing. 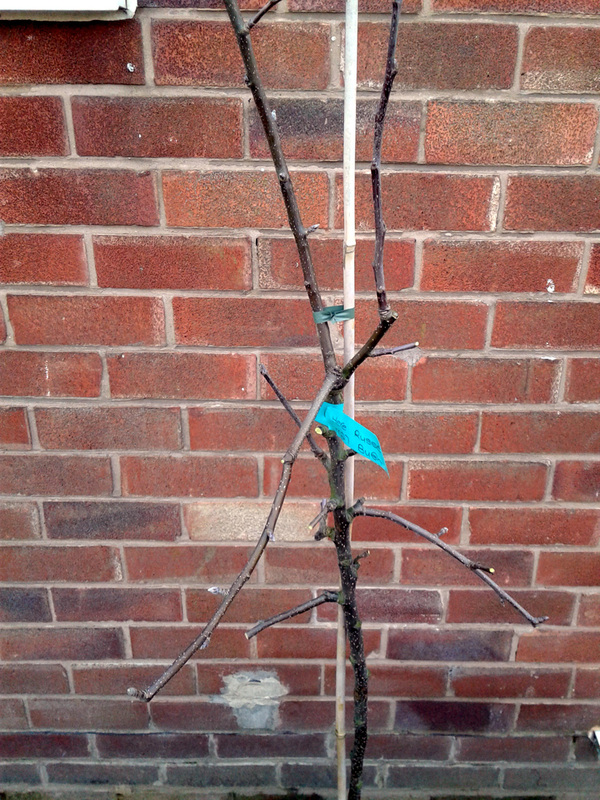 I’ve left one lateral, which is growing opposite the double-leaders, quite long to hopefully provide balancing weight and prevent the tree becoming too lop-sided. Some very long laterals here, in need of shortening. The laterals have been cut back and the leaders shortened (just out of shot). This tree was, if anything, even more awkward than the Blenheim. The bamboo cane that was used to support it was distinctly curved and it looks like the tree has grown with a definite bowing of the trunk in response. So as well as a less-then-straight main stem, there are three main leaders coming from a v-joint at the top of the stem, and then a couple of quite leggy laterals and three or four skinnier side-stems further down. I’ve done the best I can for now, reducing the leaders by around a third and pruning back the laterals to four or five buds. We’ll have to see what happens in due course. A couple of needlessly twisty, thin branches here that will have to be shortened. 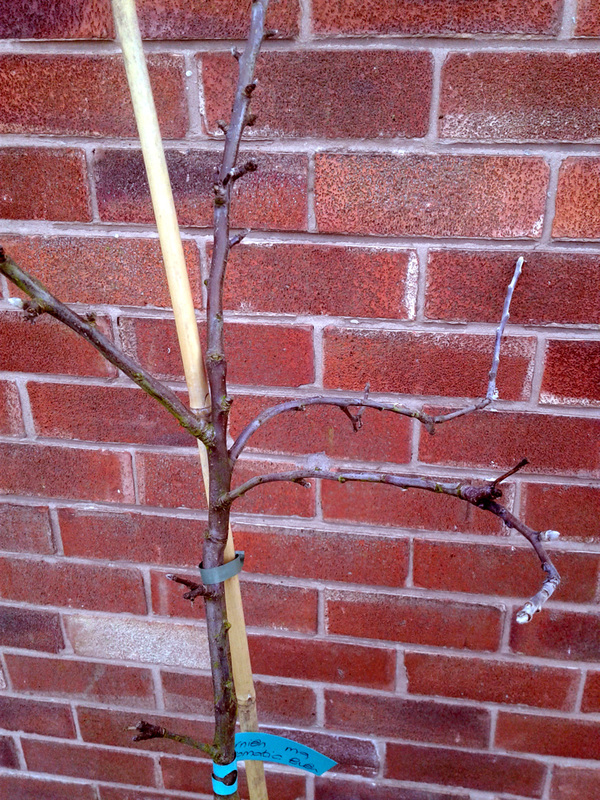 Those branches have been clipped back and will hopefully develop fruiting spurs. 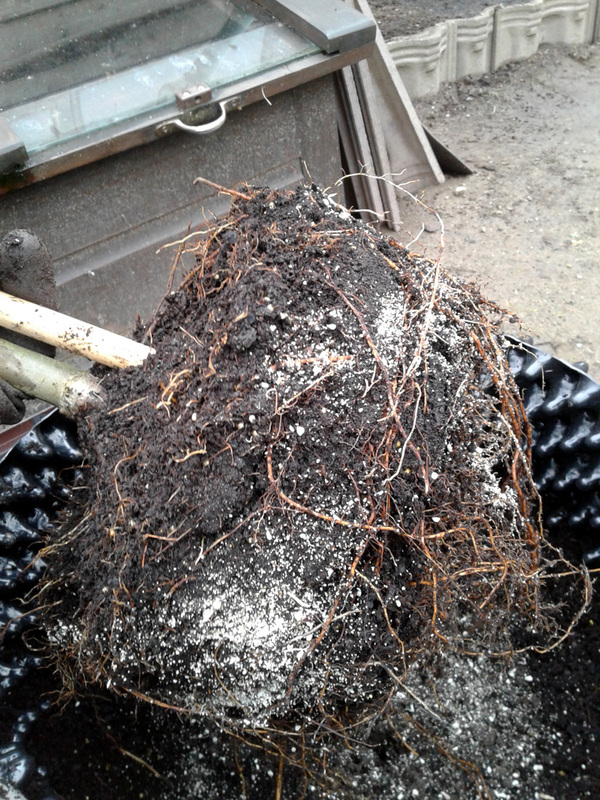 With the formative pruning done the trees were all a bit more manageable and less likely to snag and snap on anything; time to transfer them from their training pots to their new Air-Pot homes. 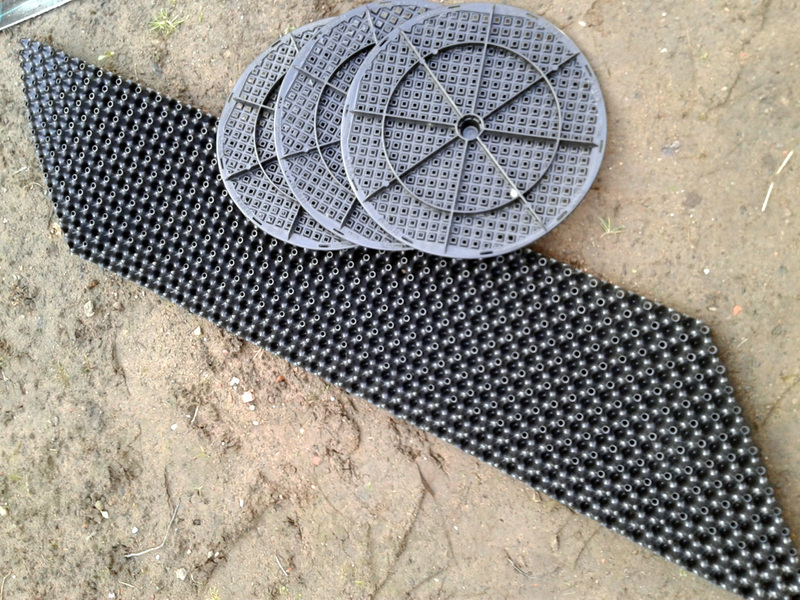 Air-Pots are widely used by commercial growers. The walls of the pots are made up of small plastic cones with the ends trimmed to leave a hole. As the plant in the pot sends out roots, they eventually grow to the end of the cones and come into contact with the air. This dries and kills the root-tip, preventing further growth of that particular root and encouraging new root formation elsewhere. 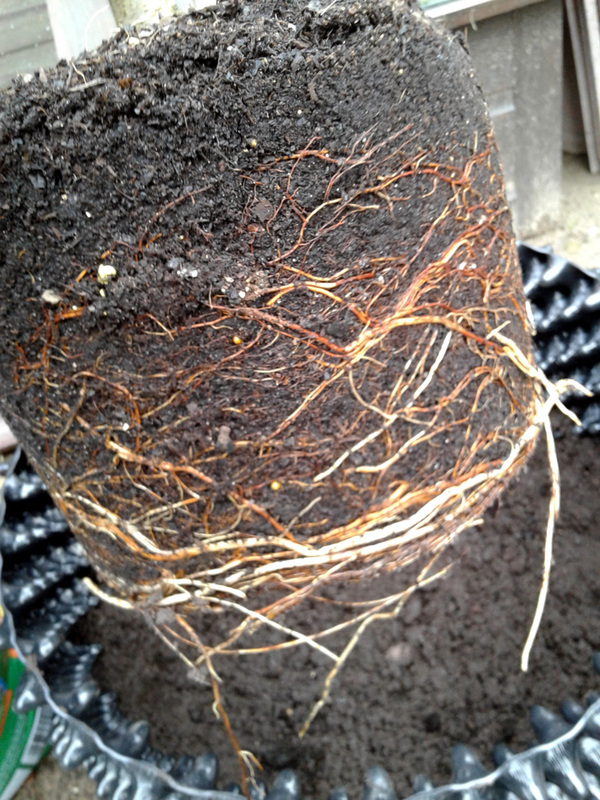 The result is a stronger, denser network of feeder roots, with little or no root-circling and no chance of the plant becoming pot-bound. 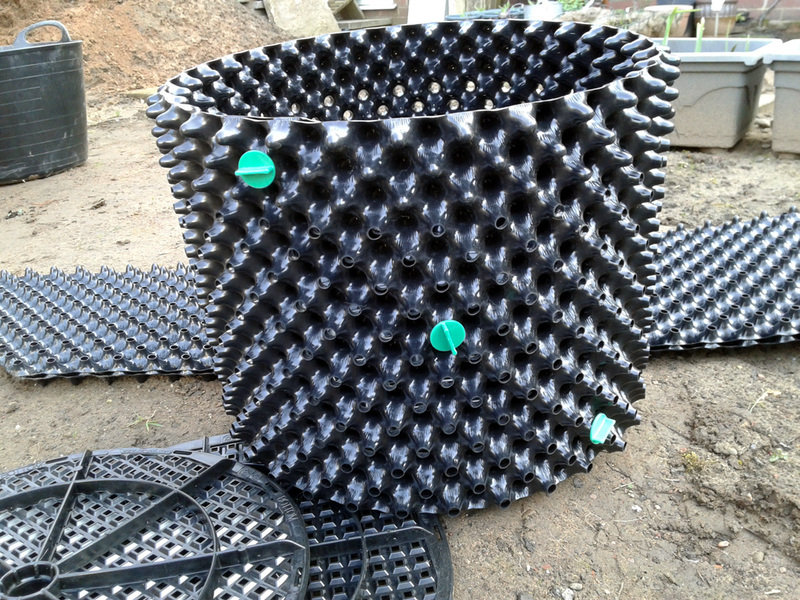 Back to the potting up: first job, rolling up the plastic sheet around the base and applying a couple of screw-fasteners to construct the Air-Pots. It takes about 2 minutes to turn these odd-looking bits of plastic into root-growth maximisers. Insert base, wrap sides around, fix in place with plastic screws… voila, one Air Pot. Next, fill the bottom and as much of the sides of the Air-Pot as practical with John Innes #3 loam-based compost, working it into all those outward-pointing cones. JI3 is quite a rich mix and should provide enough nutrients to give the trees an initial boost once they start to grow and leaf up later in the year. After a couple of months then I’ll need to provide supplemental feed on a reasonably regular basis to keep them healthy and of course, plenty of water. Good, healthy roots on this Brogdale-grown tree. Lovely. A bit of circling, but that’s easily dealt with by gently teasing the roots out from around the edges. Applied as a powder, the fungal spores are dormant until activated by warmth and moisture. Mycorrhizal fungi are beneficial fungi that grow in association with plant roots. In return for sugars taken from the roots, the fungi helps the plant to take up mineral nutrients from the soil more effectively. Perhaps it’s not strictly necessary in the case of a potted tree, but if it aids root development in the vital first year or two, then it’s worth trying. Finally, back-fill with the John Innes #3 mix and soak with a couple of litres of clean rain water. The results can be seen in the photo at the top of the post. The trees are currently standing in the shelter of the shed. This is a temporary position and they’ll probably be moved around a couple of times as work progresses on the garden, until they’re eventually put in their final position, when they can be properly staked, and perhaps a support structure put in place, if it seems as though they’ll need one. I’ll be covering fig tree plating in a separate post, and I haven’t potted up the Morello cherry just yet either, so that’s another post to come. Thank you for reading, and if you have any questions or observations on any of the above, please feel free to leave a comment, below.